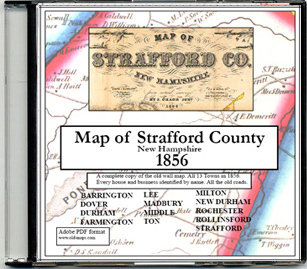 A CD ROM reproduction of the 1856 "Map of Strafford County, New Hampshire", by J. Chace Jr. The original map (a large wall map) was the most complete view to that date of who lived where in the 13 towns of Strafford County 100s of sites - homes, schools, churches and businesses- are located and named. All maps and data on the original have been scanned for this reproduction. pictorial engravings of prominent sites. PDF file (names are illegible, but you can see the format of the CD.